One of the most scenic roads in California is the coast-hugging Highway 1. Cruise past sea cliffs and windswept cypress trees, and ogle the coastal mansions of Pebble Beach on the iconic 17-Mile Drive. 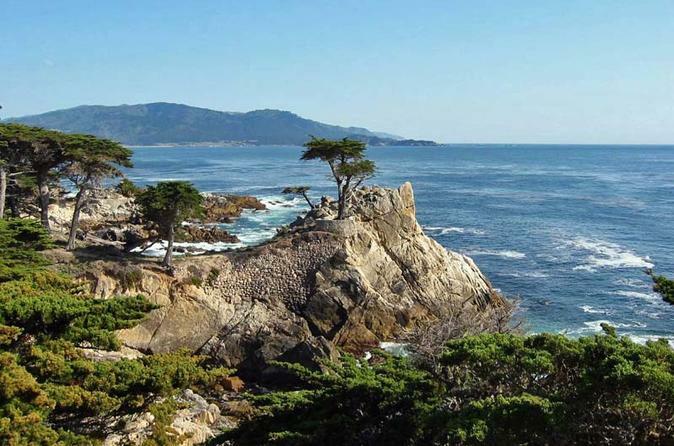 The magnificent Monterey Peninsula has been called the greatest meeting of land, sea and sky. There is plenty to explore here: you can walk down Steinbeck’s Cannery Row, visit the famous Monterey Bay Aquarium, and stroll through Carmel-by-the-Sea, an unique and charming European-style village with no high heels law, no street addresses, Client Eastwood once the mayor, and Doris Day helped make Carmel dog heaven on earth. Monterey is well known for the abundance and diversity of its marine life, which includes sea lions, sea otters, harbor seals, bat rays, kelp forests, pelicans and dolphins and several species of whales. Only a few miles offshore is the Monterey Canyon, the largest and deepest (3.2 km) underwater canyon off the Pacific coast of North America, which grants scientists access to the deep sea within hours. The cornucopia of marine life makes Monterey a popular destination for scuba divers of all abilities ranging from novice to expert. Scuba classes are held at San Carlos State Beach, which has been a favorite with divers since the 1960s. Monterey is home to one of the largest aquariums in North America, namely the Monterey Bay Aquarium, as well as several marine science laboratories, including Hopkins Marine Station.